The M.V. 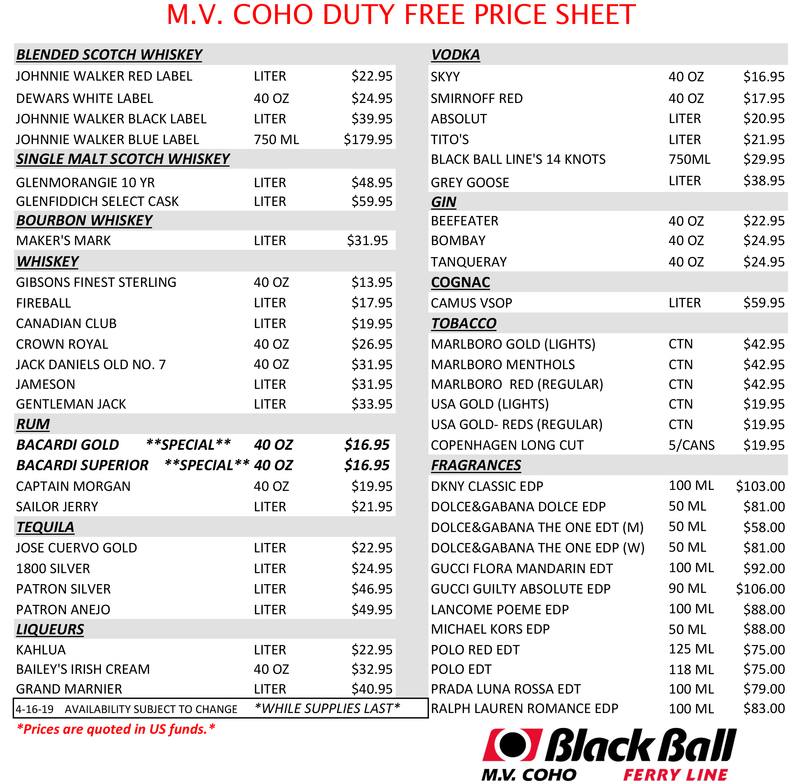 Coho features a selection of duty free products aboard the ship. We offer the largest selection of duty free liquor in Victoria, with a wide range of products from single-malt scotch to tequila, rum and vodka. In addition to spirits, we offer duty free cigarettes as well as a range of designer frangrances. Purchase allowances vary by country. Each person may bring articles purchased in the U.S. valued up to $200 CND duty free. Alcohol and tobacco products are not permitted. Each person may bring articles purchased in the U.S. valued up to $800 CND duty free including 200 cigarettes, 50 cigars and 1.14 litre (40 oz) of alcohol. Duty is assessed only on the portion that exceeds $800 exemption. Each person may bring articles purchased in the U.S. valued up to $800 CND duty free including 200 cigarettes, 50 cigars, and 1.14 litre (40 oz) of alcohol. Duty is assessed only on the portion that exceeds $800 exemption. Each person may bring articles purchased in Canada valued up to $200 U.S. duty free. The dollar amount may not include more than 50 cigarettes, 50 cigars, 150 ml (5 oz) of alcoholic beverages and 150 ml (5oz) of perfume containing alcohol; otherwise, all articles may be dutiable. Family members may not combine their individual exemption. Each person 21 years of age and older may bring articles valued up to $800 including 1 litre of alcoholic beverages, 200 cigarettes and 100 cigars. Family members may combine their exemptions. If the value of the goods exceeds the monetary limit of the exemption, the exemption is void and duty is assessed on the entire value of the goods, not just the portion that exceeded the exemption. For more information, please visit U.S. Customs and Border Protection or Canada Border Services Agency.